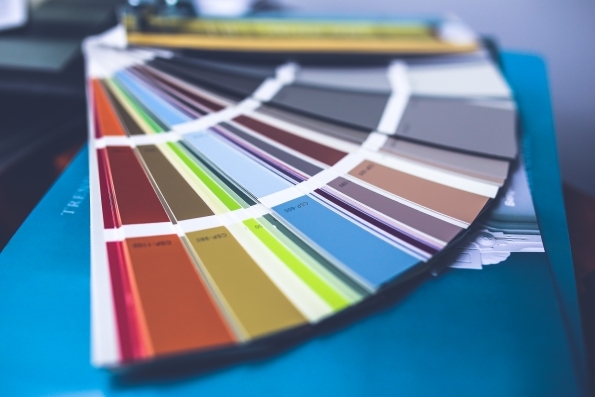 Whether you are considering buying a home in Zionsville, IN and want to add a personal touch to each room or are just looking to give your kitchen a makeover, choosing a color scheme is the most logical place to start. When selecting a color scheme for a particular room in your Zionsville, IN home, it’s important to think about the purpose of the room and the mood you want to evoke. Most importantly, the space should be livable and feel like home! The easiest way to transform a room is with a fresh coat of paint, but what color should you choose? What color would look best as an accent? Here’s where color theory comes to the rescue, and you don’t have to be a professional interior decorator to experiment. Remember the color wheel from art class? Complementary colors sit opposite on the color wheel and work well together to build a color scheme for a room. When it comes to selecting your palette, look beyond the obvious primary colors and consider more sophisticated, natural shades like sage green, dark olive and mustard yellow. Analogous colors sit next to one another on the color wheel. When used the right way, selecting analogous colors can create a striking contrast in the interior of your home. It’s also important to consider how you want to feel and how you want visitors to feel inside your Zionsville, IN home. Warm colors, such as reds, oranges, and yellows are bright colors that give off a homey appeal. Cool colors, like blues, greens, and purples work best for creating a space where you’ll be relaxing. Warm and cool colors can be mixed if you do so successfully using your new knowledge of complementary and analogous colors. Now that you have selected a palette (no more than three colors), it’s important to make sure you have the right balance. Interior decorators use the 60-30-10 Rule to pull a room together and give it a cohesive look. Use 60 percent of the dominant color, 30 percent of the secondary color, and just 10 percent of the accent color to ensure the room is balanced. When you look at the finished product, you should feel comfortable with how the space looks and feels. After all, this is your home. If you feel challenged and can’t quite nail a color palette that works with your taste and preferences, enlist the help of a professional. As a Zionsville, IN real estate agents, we can recommend some interior decorators in the area who can give you their professional opinions. Along the same line, an interior decorator comes in handy if you’re planning to sell your Zionsville, IN home and want to make it as appealing as possible to potential buyers. Please contact a Zionsville, IN real estate agent if you need any assistance!